With the power of imagination and creativity without limits, we don't just make toys. We create to bring forth the greatest laughter, memories and joy. Our focus and dedication blend personalities and innovation to perfection... entertaining, encouraging, and supporting healthy development of all youngsters. 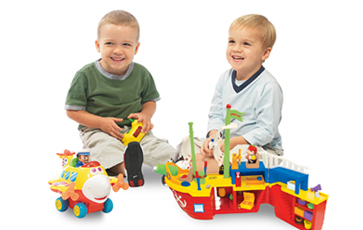 With our innovative and top quality toys at competitive prices, we shall continue to strive in becoming a more professional toy maker. Our strong sales & marketing capabilities coupled with our in-house vertically integrated manufacturing facilities have enabled us full flexibility and cost-efficiency to provide professional service that will promise you the best business relationship. Copyright ©2019 Kiddieland Toys Limited, Kiddieland International Limited (Stock code: 3830.HK) All Rights Reserved.